Morrison Remick "Mott" Waite (November 29, 1816 – March 23, 1888) was an attorney and politician in Ohio. 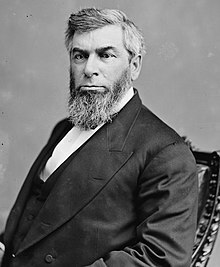 He served as the seventh Chief Justice of the United States from 1874 to his death in 1888. During his tenure, the Supreme Court took a narrow interpretation of federal authority related to laws and amendments that were passed during the Reconstruction Era to expand the rights of freedmen and protect them from attacks by vigilante groups such as the Ku Klux Klan. There is in our political system a government of each of the several States, and a Government of the United States. Each is distinct from the others, and has citizens of its own who owe it allegiance, and whose rights, within its jurisdiction, it must protect. The same person may be at the same time a citizen of the United States and a citizen of a State, but his rights of citizenship under one of those governments will be different from those he has under the other. The very highest duty of the States, when they entered into the Union under the Constitution, was to protect all persons within their boundaries in the enjoyment of these 'unalienable rights with which they were endowed by their Creator.' Sovereignty, for this purpose, rests alone with the States. It is no more the duty or within the power of the United States to punish for a conspiracy to falsely imprison or murder within a State, than it would be to punish for false imprisonment or murder itself. Property does become clothed with a public interest when used in a manner to make it of public consequence. When, therefore, one devotes his property to a use in which the public has an interest, he in effect grants to the public an interest in that use, and must submit to be controlled by the public for the common good, to the extent of the interest he has thus created. We know that this is a power which may be abused; but that is no argument against its existence. For protection against abuses by legislatures the people must resort to the polls, not to the courts. Laws are made for the government of actions, and while they cannot interfere with mere religious beliefs and opinions, they may with practices. This page was last edited on 22 December 2017, at 20:44.